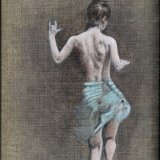 My little painting, "Girl Hopping", based on a photograph by Edweard Muybridge from the "Human Figure in Motion" series, was sold in Richmond this week. I'm going to miss her! Sometimes a painting transcends the ordinary and somehow attains a state of grace, and "Girl Hopping" had a quality of carefree innocence which lent her an unusual charm. The show as a whole was well attended but only two paintings were sold off the walls, so I'm delighted that mine was one of them.